Can use the code in store and online, ends midnight tonight! 28th March 2018 Can be used on sale items as well. Note; P&P fee still applies. What actually is the code because it just brings me to the hollister website? Thanks OP. Got 4 pairs of boxers for £12 instead of £12 a pair.... Perfect bed shorts when the weather gets warmer...! Thanks. Have updated the post. Nope. It’s only if you join their CLUB CALI. 25% off	Black Friday sale on Hollister. 25% off on entire purchase Today! Online only. 20% off	20% Hollister including sale items + free delivery! Just tried it on sale items got this message "SORRY, EITHER THE MERCHANDISE YOU HAVE SELECTED IS NOT ELIGIBLE FOR THIS PROMOTION, YOU MUST BE LOGGED IN IN ORDER TO REDEEM THIS PROMOTION, OR THE MERCHANDISE TOTAL DOES NOT REACH THE REQUIRED PROMOTION AMOUNT. PLEASE SEE PROMOTION DETAILS." INSTRUCTIONS: Add the coupon code at checkout to claim. Thanks! Ordered some new boxers for £9.60 Each! Used Click &amp; Collect for Free as well. Place the items you’d like to buy in your basket and sign in. At your “Shopping bag“, you´ll see the option “Promo Code“. 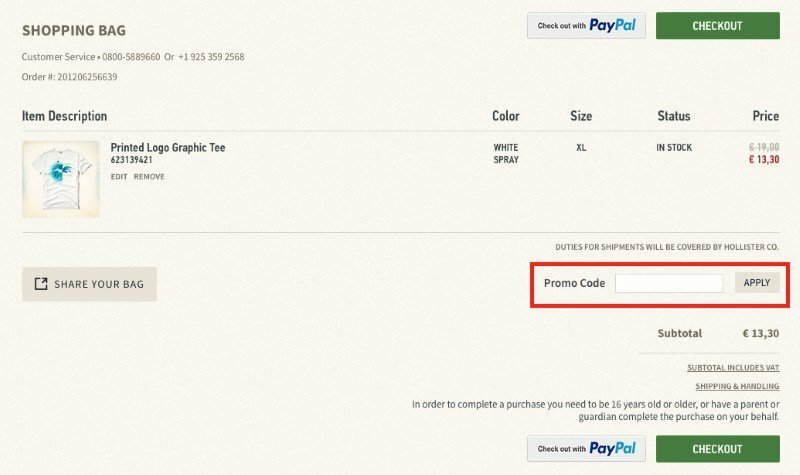 Type in the code of your discount voucher into the box provided and press “Apply“. The discount will be immediately reduced from your subtotal. Choose “Checkout“ and finish your order. Visit the e-Gift Voucher page at Hollister´s online shop. Click on the design you prefer from the six available. Fill in the amount and recipient details. Add your name and message. Sign in and pay in the usual way. The e-gift card will be delivered to the e-mail account of the recipient within 3-4 working days. Go to the online shop at www.hollisterco.com, sign in and put the goods you’d like to buy into your basket. Head to the “Checkout“ and click through to the payment screen. At step 2 of the checkout process type in the 16 digit number on the card and also the PIN, in the gift card box.